Wound Relief™ is a silver colloid gel that is perfect for everything from scratches and road-rash to puncture wounds & burns. Silver Colloid Gel for all your skin issues! Wound Relief™ is a silver colloid gel that is perfect for everything from scratches and road-rash to puncture wounds and burns. Every household should have a tube of Wound Relief™. Keep one in the car for when you are on the go and the little one falls and scrape their knee. Working in the garden? Wound Relief™ works great on those pesky bug bites and thorn punctures. If you have any kind of skin irritation, this gel is the perfect and the first thing you should be reaching for. 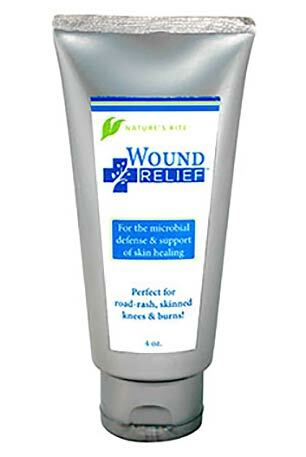 Our Wound Relief™ is made with Aloe Vera to soothe and support healing. It does not matter what the skin issues is; rashes, burns, scrapes, cuts, bites, punctures, road-rash, sores and more!